The third title in National Geographic Little Kids First Big Book series, this book is for kids 4- to 8-years-old who LOVE dinos! The third title in National Geographic Little Kids First Big Book series, this book is for kids 4- to 8-years-old who LOVE dinos! 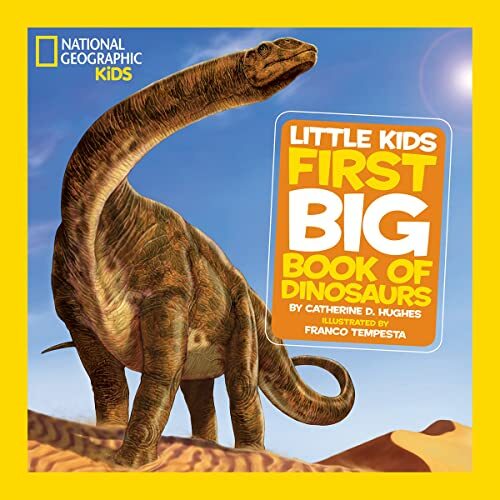 The prehistoric world comes alive with dinosaurs small, big, giant, and gigantic, with stunning illustrations by Franco Tempesta-who illustrated National Geographic Kids The Ultimate Dinopedia. Bursting with fun facts and age appropriate information, each spread features a different dinosaur, along with simple text in big type that is perfect for little kids. Young dino fans will love the interactivity included in every chapter, and parents will appreciate tips to help carry readers' experience beyond the page.